What is a hybrid bike? The answer to the question lies in the terminology itself. To be precise, a hybrid bike is a cross between a mountain bike and a road bike so it incorporates the unique features of the latter bike categories. Simply put, hybrid bikes can be ridden on both paved and metalled roads as well as on rocky, sandy, and other kinds of rough tracks. A hybrid bike’s frame is ergonomically designed enabling the cyclist to sit in an upright position that is comfortable enough so as not to cause any stress on the neck, shoulders, and the back. A completely flat handlebar is another standard feature of hybrid bikes enabling the rider to steer the bike steadily while remaining in an erect position. The benefits that you’ll derive from using a hybrid bike will largely depending upon the specific features of the particular bicycle not to speak of the disadvantages. For instance, if you’re looking for a hybrid version that will be more convenient for riding on mountainous, elevated or jagged tracks, then you’ll have to be mentally prepared to sacrifice speed riding. 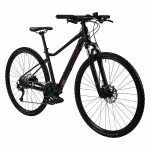 Though hybrid bikes generally come fitted with larger and wider wheel sets for smooth riding on city roads and streets, you can install either treaded road bike tires or knobby tires housed in mountain bikes. Hybrids bikes are synonymous with versatility and the most adaptable amongst all categories of bicycles. You can take a hybrid along a road paved with stones and pebbles, ride it on muddy or sandy track, and steer up a steep mountain path. The wheel rims and tires of a hybrid bicycle are meticulously designed which makes the bike sufficiently effective to be ridden on a wide range of terrains and trails. Hybrid bikes are classified under the hardtail bicycle category which implies that they’ve a front suspension system. The suspension fork tethered to the front wheel and the spring coils underneath the saddle prevents the cyclist from bumping when riding over a road breaker or hurdle. To keep oneself in the pink of health it is extremely essential to exercise on a regular basis. Surely, riding a hybrid bike is one of the best means to boost blood circulation and keep the muscles in the body active. A premium quality hybrid bike comes with attachments for securing a water bottle, a basket attached to the middle of the handlebar for storing essential items, and karabiners for strapping carry bags or rucksacks. Hybrid bikes come with frames that are generally carved out of steel, aluminum, carbon fiber, and titanium. The affordable models usually have frames made out of either steel or aluminum while the more costly ones feature carbon fiber frameworks. The high-end and premium models have frames curved out of titanium which makes the hybrid bike portable enough to be carried up the stairs or lifted onto a bus. At the same time, the durability of a frame enables it to withstand rough handling and routine wear and tear. A hybrid model is designed and built to be used on an array of terrains and so it goes without saying that such a bike is equipped with front and back derailleurs each having multiple gears. Hybrid bicycles typically come with 21-24 speed shifters. Almost all quality hybrids come with hardy fenders that acts as a shield preventing water or slush squirted up by the tires from soiling you. Many models come with rack mount at the backend that allows you to place your backpack in it which shifts your center of gravity to the lower side thereby letting you ride with steadiness. Entry level bikes usually have disc brakes that can be difficult to adjust and set up compared to topnotch models that have V-brakes. The tires and rims housed in hybrid bikes are narrower and heavier than their counterparts in road bikes. So, the most noticeable upside of using such a tire is that you don’t have to worry about the same going flat. And the worst downside is that you’ll have a trying time even pedaling on elevated territories, let alone cruising. 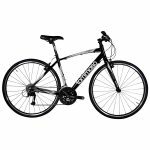 The Diamondback Bicycles 2016 Women’s Vital 2 Complete Hybrid Bike is a pleasure to ride regardless of whether you’re trying to get to office in time or attempting to keep yourself fit. The DB aluminum framework has been designed scrupulously that keeps you steady without having to sacrifice comfortableness. The front suspension fork checks vibrations and wobbles while you’re going downhill. The steel handlebar makes for steady yet comfortable grip while you ride through rocky or paved tracks. The drivetrain sports 21-speed shifters letting you pedal at a speed you’re comfortable. 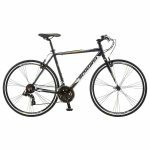 The Tomasso La Forma Lightweight Aluminum Hybrid Bike is a full performance bicycle that allows you to smoothly ride on any hostile terrain in the countryside or in the mountains as well commute on city roads. The bike features a compact and sturdy aluminum frame, HCT carbon fork, and gel grip handlebars that let you pedal steadily and effectively on any surface. The drivetrain comprises a Shimano Acera gear set which again is made up of 48/36/26T crankset and 11/32 cassette allowing cyclists to alter gears in accordance with the terrain. 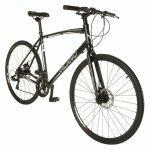 If you’re looking for an affordable hybrid bike that you can use for commuting to office or the supermarket as well as for off-roading, then the Men’s 1200 700c bike from Schwinn is perfect. 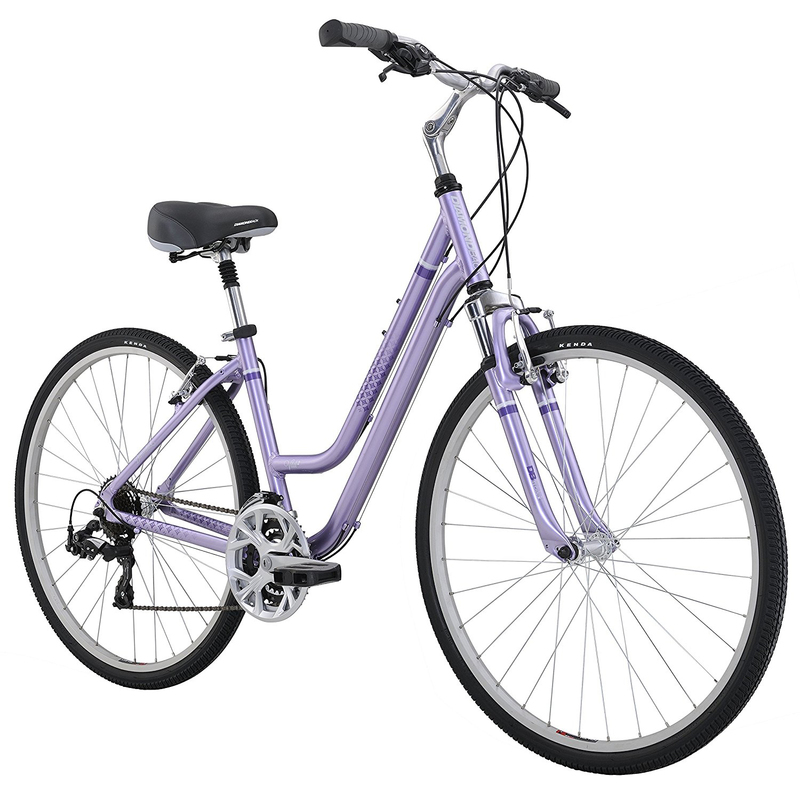 This Schwinn hardtail hybrid bike comes outfitted with proprietary aluminum frame and fork that offers you stability during rides and keeps vibrations to a minimum. Alternatively, the 21-speed Shimano speed shifters with rear derailleur come handy for shifting gears smoothly as per your convenience. The Vilano Diverse 3.0 is another highly affordable hybrid bike equipped with functional features that you can make the most of when you’re commuting to office or cycling in the woods. The framework and fork, shaped out of 6061 aluminum, the mechanical disc brakes, the 24-speed Shimano gears, 700c Kenda tires, and Shimano Tourney TX front/back derailleur systems, all coordinate seamlessly resulting in comfortable rides. The Marin San Rafael DS3 LE Sport Hybrid Bike has been designed and fabricated with meticulous care enabling the veteran cyclist to glide on a pavement or pedal on a graveled track. At the core of this hybrid bicycle is a robust Marin Series 3 aluminum frame with drilled orifices for attaching fenders and racks. The Suntour hydraulic lockout NEX fork dampens vibrations and impacts as you cruise on city roads or unpaved trails. A hybrid bike serves as the transition between a mountain bicycle and a road bike. So, riders who want to go for a bike that they would be able to ride on a variety of terrains can choose a hybrid model instead of buying two different bicycles. 5 different brands of hybrid bike-Diamondback, Tomasso, Schwinn, Vilano, and Marin Sal Rafael- were reviewed where each and every model was found to be satisfy the criterions for labeling under the category of hybrid bikes.